The Ergo ATF is ideal for fast stacking and long distance pallet transportation with the ability to handle all kinds of pallets/ load carriers. The forklift operator is effectively protected by the overhead guard and the driver compartment. The telescopic forks on the Ergo ATF pallet stacker allow you to reach double-pallet depth into racks. In some applications, this function allows you to use the ATF pallet stacker in place of a small reach truck. The double depth function is also very useful when extra reach is needed to load/unload delivery trucks. It’s easily accessible controls and power steering allows for optimal pallet stacking performance. 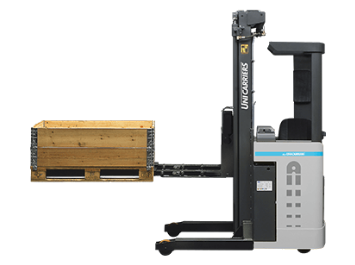 Pioneered by Atlet, the Ergo ATF is a versatile, space saving, stand-in stacker for efficient stacking, internal pallet transportation and double pallet handling. It is ideal when operators need to get on/off the pallet stacker frequently. Save up to 30% in warehouse floor space by handling two pallets in depth from the same side of the aisle. Atlet Modular Concept design for highest First Time Fix Rate. Atlet Stability Support System S3. The Ergo XTF pallet stacker is for stacking and internal pallet transportation. It can handle all types of pallets/ load carriers. The telescopic forks allow you to reach double-pallet depth into racks, which can sometimes replace a reach truck. This feature is also very useful when extra reach is needed to load/unload delivery trucks. The XTF double deep pallet stacker features advanced ergonomic design, including Atlet’s unique power-assisted mini steering wheel, and fully adjustable armrest, seat, and floor for productive handling and safety. The operator is fully protected within the chassis and has an excellent overview of pallet loads for safe and precise handling. Pioneered by Atlet, the Ergo XTF sit-on pallet stacker allows you to stack double deep. Save up to 30% in costly warehouse floor space by handling two pallets in depth from the same side of the aisle. ATC truck computer with PIN code access for onboard diagnostics, optimum performance settings and preventing unauthorized use.